1 Gallon: Opening diameter：6.3"; Bottom diameter：4.9"; Height：6.9". 2 Gallon: Opening diameter：8.7"; Bottom diameter：7.3"; Height：8.5". 3 Gallon: Opening diameter：9.4"; Bottom diameter：7.7"; Height：10.4". Uses: hotels, restaurants, home kitchens, bathrooms, etc. The large space capacity makes it perfect to plant. You can plant flowers and grow vegetables. Designed with multiple outlets at the bottom, it is to allow plants to breathe freely. 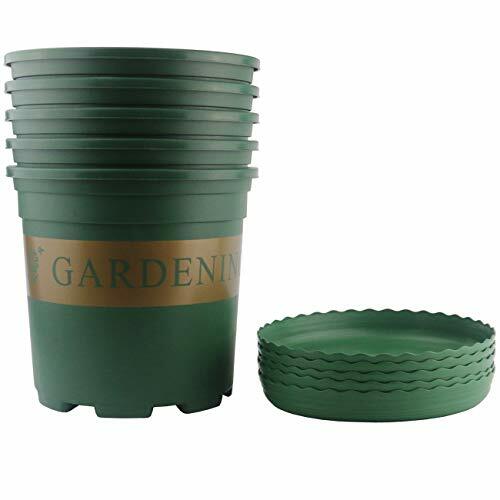 Durable, thick injection-molded plastic nursery pots with extra strength and durability in cold and hot climates to reduce cracking. Excellent Drainage Design, effective watering in any conditions. It is the best helper for lovers of plants and flowers. If you want to grow fresh vegetables, it is also a good choice for you! Material: Premium Plastic. Durable, thick injection-molded plastic nursery pots with extra strength and durability in cold and hot climates to reduce cracking. Bottom drainage design: Excellent Drainage Design, effective watering in any conditions. Avoid drowning plants because of too much water. Function: You can plant your favorite flowers, make the room or garden more beautiful and vibrant. You can also grow vegetables to make your food healthier. Size: Opening diameter：9.4"; Bottom diameter：7.7"; Height：10.4". Offer a wide base, which is ideal for shallow rooted plants and produces a better root ball. If you have any questions about this product by Ogrmar, contact us by completing and submitting the form below. If you are looking for a specif part number, please include it with your message.